So my exams are finally finished! I am super happy that I've finished and can now just relax, but at the same time I'm not sure what to do with myself. I've just been having a lazy Sunday but feel like I should be doing something else! I just wanted to do a quick update on how my new years goals had been going. I've been doing quite well with some things and not so well with others. For example, with my blogging aims I managed to tweak my design and add pages (just today) however, I've pretty much failed in commenting three times a day on different blogs. But hopefully now I've got a lot more free time I can start to be a bit more active when it comes to commenting. 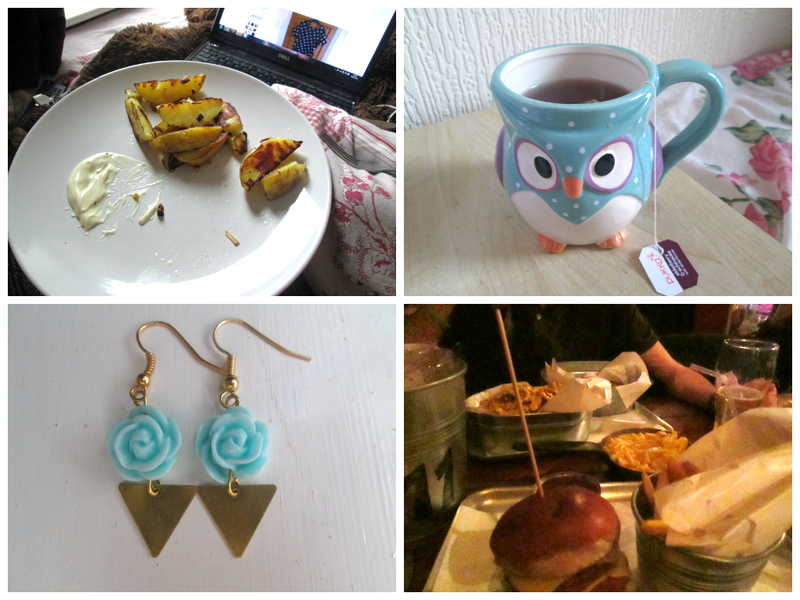 homemade wedges, green tea in my owl mug, handmade earrings, smoke house restaurant. 001. So far I have managed to cook a new thing every week. I have been making these homemade garlic wedges a lot. All you have to do is heat up a potato until soft, cut them into wedges shape and fry them in oil and garlic until they are crispy to your liking. Unfortunately, I have chose the unhealthiest and quickest version to cook these, therefore my goal to be more healthy is failing a bit, but they taste delicious! You have to cheat now and then you know. 002. I also wanted to drink more green tea for many reasons. I've been drinking green tea but also been branching out into camomile tea. It did take me a while to get used to the taste of it as I personally don't think it really tastes of anything, but I'm slowly starting to like it. I've also found it's a great cure for a hangover. 003. I've been making earrings a lot recently. I have not yet re-opened my shop but have been ordering and making lots of little bits that I hope will be on there. These were one of the favourite pairs that I made during the week. 004. When it comes to healthy eating, it has been a huge fail! I'm still snacking like I did at Christmas and I've found it so hard to get into a routine of healthy eating and not snacking in between meals. I went out to celebrate my last exam by going to a smoke house/saloon. The insides was Western/American themed and was amazing, however, a smokehouse is not the best place for a vegetarian. I had a veggie burger with a portion of fries and a side of mac n cheese, which was absolutely delicious. How are you doing with your New Year goals?